Mod The Sims - "Old Town Revival"
Replies: 158 (Who? ), Viewed: 32680 times. | You are currently not a member of this group. Would you like to join it now? #1 17th Apr 2017 at 1:21 AM Last edited by srtv : 26th Aug 2018 at 5:12 PM. My neighborhood is the City of "Old Town", I got the hood from this forum, but without Sims, after that I extracted and cloned several Pre Made Families from the base game and expansions, and also from some families that I got years ago in others sites, thanks for the people that made the extracted and clone tutorials, if I didn't follow that guides, my game right now will be done. 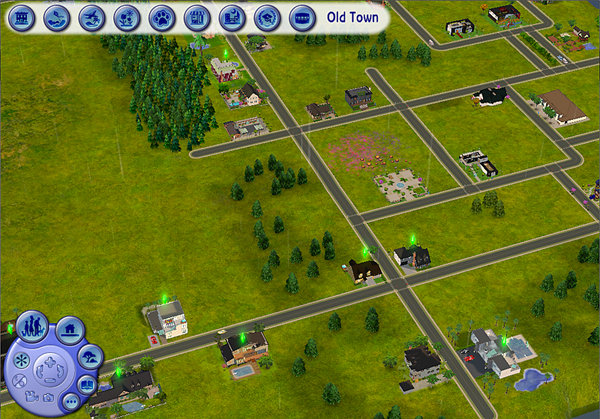 Also, I downloaded the following sub-hoods from MTS: Riverside, Bitville, Four Corners and Sedona, mostly for the Sims, so my "Old Town" right now consist on the Old Town terrain in the center, the Riverside and Bluewater Village like commercial hoods, the downtown called "Nocturna" and the Vacations Hoods, also the University is Académie Le Tour, with a mix of the pre made that came with the Uni expansion. My type of game right now is very simple, I'm changing the looks of several Sims, and making simple interactions to further their stories, but I'm not near half the rotation. I'm not a great decorator, so my hoods are pretty simple as compared with some of yours, but I tried my best for my little Sims. The history of my city is simple, Mortimer Goth resurrected an old city that his ancestors created, and invited several prominent families to live there, also young professionals and talents were invited. His daughter Cassandra thought that a lottery was the perfect choice to get more diverse people, so Mortimer went with this idea also. Here are some pictures of the Hood and of some families, sorry about the quality of the hood, but this is a work in progress. 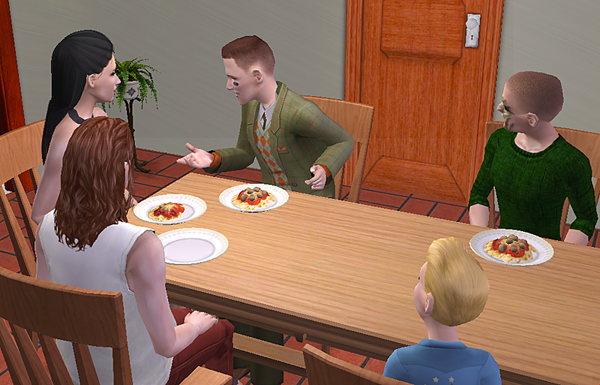 "Rutherford and his new roommate Dennis..."
Also, I used OneNote to take notes and register the Sims, their families, the links between them, photos and stuff, is pretty handy to don't get lost between so much Sims. 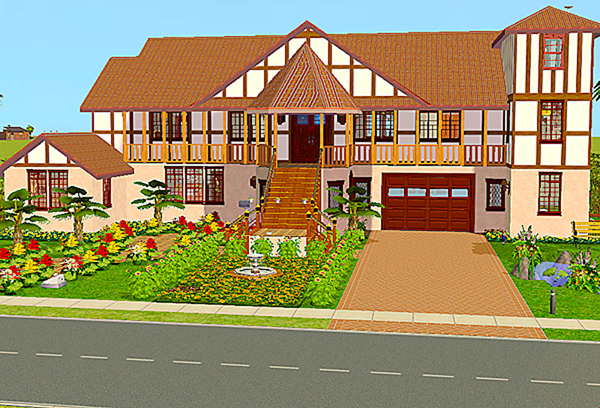 I love your version of OldTown, and how your sims look! I can't wait to read the stories you've mapped out for them . I play with a modified Acad�mie Le Tour and I play with a modified Bluewater Village as well. I like the look of your Sims and I look forward to more. What ever you do, I am interested. I’m not a great decorator, so my hoods are pretty simple as compared with some of yours, but I tried my best for my little Sims. Nonsense! Your neighbourhood looks very pretty. I like to see how others play and I always get inspiration from seeing pictures here, and yours is no exception. It looks beautiful, and your sims are lovely! I can't wait to see more images and hear about how your sims are getting along- it seems that you have a quite diverse bunch with some strong characters there. 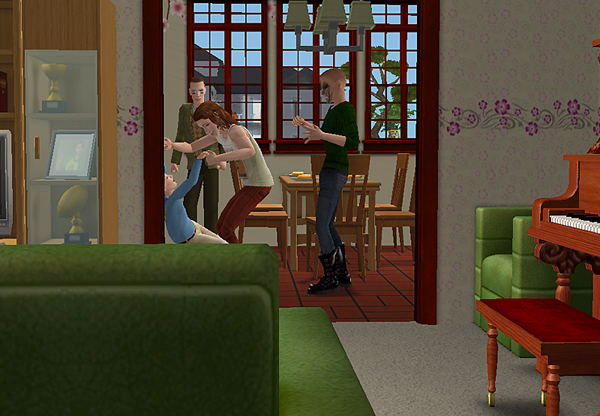 And you know there will be drama when you have Calientes and Landgraabs! Your pictures and your hood look fine to me. I love the backstory of Old Town. I'm looking forward to knowing more about your sims. Thanks so much, I'm trying to take more screenshots to present some of the families that I have. Thanks, I love the Academie Le Tour, that's the reason I choose that campus to be the only Uni of my city, and Bluewater Village is great, I put a lot of new business and entrepreneurs living there... thanks for the interest! #7 18th Apr 2017 at 2:11 AM Last edited by srtv : 26th Aug 2018 at 5:13 PM. I want to present to you the Goth’s, they are Mortimer Goth, the head of this family and the city, his former wife Bella doesn’t have memories of her past, and less from her husband and children, so Mortimer called his brother in law Michael Bachelor to look after her, and gave them a good house in the center of Old Town. In the meanwhile, his daughter Cassandra met a young man that was recently divorced, the young man’s name is Francis Worthington, after a couple of weeks they got married to make a great alliance of wealthy families. 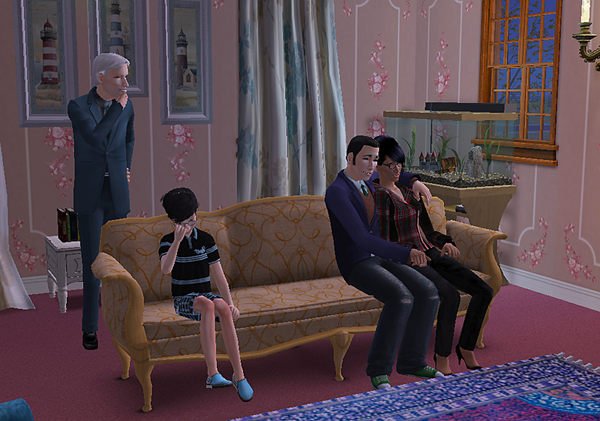 Also Alexander, the youngest son is the heir of the Goth’s fortune, so his life is pretty good so far. Neither Cass nor Alex have news of their mother, and Mortimer and Michael are trying to keep that news from them, because they want to surprise them when their Mother regain her memories. Francis was married to Jessica Peterson, but she cheated on him with Ajay Loner, also Francis is the first graduate of the Acadčmie Le Tour. Riley Harlow (Four Corners ) is a great person, but she is always in the middle of problems, so her aunt Sharon and her mother Jane decided to change of City to meet new people and to help Riley with her life. Riley is trying to stay away of troubles, and the other day in the Gym of Bluewater Village she met Vicent Moore (Bitville ) a wealthy young man that caught her attention. Today she is going to their first date. I love your incorporation of visuals, and your relatable, albeit interesting introduction of the characters! Thank you simsample, I appreciated your comments, I love the mix that can result of the pre mades meeting each others, and I can tell you that the Caliente sisters already are making an impression at Old Town. My favorite character right now is Samantha Hayden, she’s a brilliant and evil Sims that wants fame, power and money… also love, but that not the main goal for her, currently she is dating more than 10 single guys, and two married ones. #10 20th Apr 2017 at 2:41 AM Last edited by srtv : 26th Aug 2018 at 5:13 PM. Thanks for the update, I like how you take pictures, I am trying to do the same. Interested in more when you get a chance to post. #12 23rd Apr 2017 at 2:27 AM Last edited by srtv : 26th Aug 2018 at 5:14 PM. The only full family that I got in my mega hood from Strangetown was The Grunt family, I just love all the four characters. So the history is the same, the General was searching a place to move, after the death of his former wife. When he saw the “Old Town” ads, he didn’t wait and bought a house in Riverside, the quiet and more nature friendly part of the city. Tank wasn’t happy about the change of city, he was so close to get in the army, but now he will need to start all over again. His brother Tripp has mixed feelings, he’s happy with a new place, but he will miss all the lights and the noise of the big city. Buck is also there… After a couple of months, the General started to date different women with the objective to find a stepmother for his children and also a good company for him. He met Samantha Hayden, Nina and her sister, and several other young women, but one day he saw a woman crying, her name was Martha Russell (Riverside ), she was crying because her father and her best friend are now a couple, maybe that was not a great drama, but that day Martha discovered that her former friend was also having an affair with her son. The General started to date Martha, after she moved into an apartment. They married after a couple of months. Martha is a decent wife, she’s kind and happy, sometimes Buck had found her crying in the bathroom, but the General Buzz told his son that Martha is having bad memories about the drama with her family. Tripp is happy, he’s still having problems with his father and Tank, but Martha is a good friend for him, and also he found a special someone in Riverside. The General Buzz bought a bigger house in the upper side of “Old Town”, and today they finished the household move. 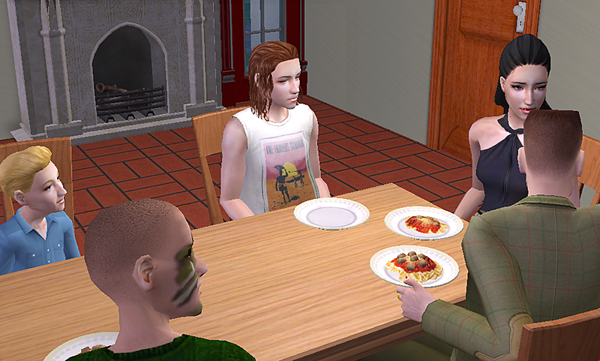 "Buzz, Tank, Tripp and Buck"
"The first dinner in the new house... 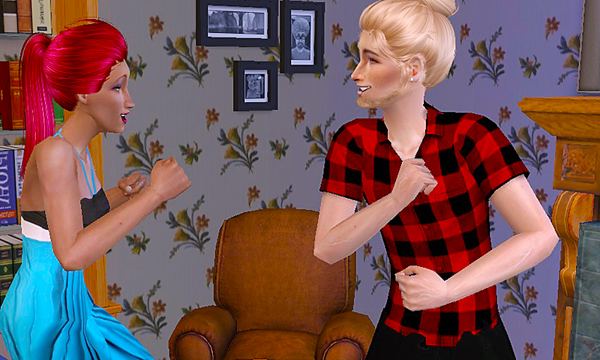 I love Martha and I hope she gets a happy life with the Grunts..."
Lovely sims, and lovelier stories . #15 1st Jun 2017 at 10:30 PM Last edited by srtv : 26th Aug 2018 at 5:14 PM. 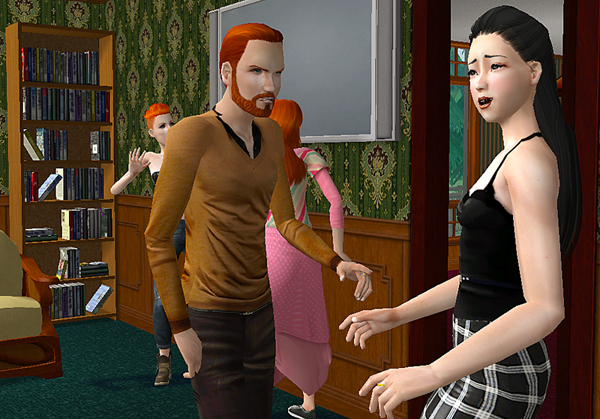 Currently, I’m doing a major surgery to many of my Sims, so I didn’t play much in the houses, but one of the families that got time of play was the Debateau’s, right now Armand is having the time of his life with his daughter, but also in this new city, the ladies are so interesting to him, so maybe is time to start playing the dating-game. In the Meanwhile Tara is having a bad time at school, because of the Mean Girls (Angela Pleasant, Sandra Roth and Danielle Brooke), so she’s convinced that if she forms another group of girls, she will stop the reign of horror of Angela and her minions. #16 5th Jun 2017 at 4:20 PM Last edited by srtv : 26th Aug 2018 at 5:14 PM. Pretty garden - I'm such a sucker for plants. 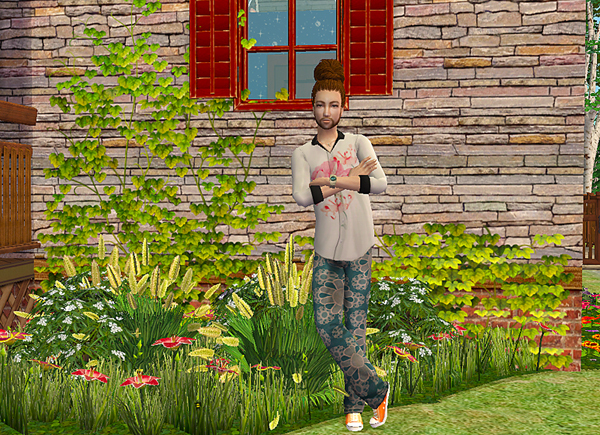 Thalia is so beautiful, what lovely and distinctive looking sims! Thanks for another wonderful update. And I do concur that the garden is rather exquisite. 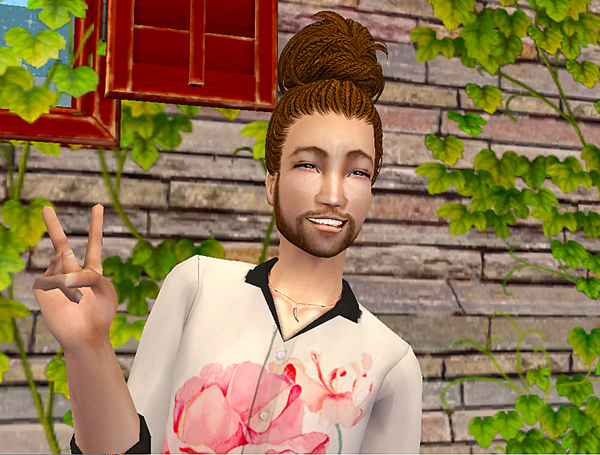 I love what you do with your Sims and they look good as well. Nice house for the Grunts I think. I enjoyed your recent post, looking forward to more. Thanks for your comments, first I want a military house for the Grunt’s, but I thought that Martha should have some decision in the choosing of the house, and Tripp loves Martha, so him and his little brother took a side with her in the decision, The General was ok with that, he is truly in love with Martha, and he’s happy that all of his sons are in a good place with her. So the house was bought with furniture, but I think The General and Tank will soon start to change some things, for example the backyard with some tools and military equipment, and also they need a house gym as soon as possible. #21 6th Jun 2017 at 9:28 PM Last edited by srtv : 26th Aug 2018 at 5:16 PM. About the Pleasant Family, I believe that their storyline is one of the few that I really like from the pre made ones, so I’m my “Megahood”, Daniel cheated on his wife, but not with the maid, instead with Bella Bachelor, Mary-Sue caught them and they fought like very indecent people, it was a great scandal in the city. Angela can’t believe that all that drama is happening to her, her popularity in the school is going down, and her friends are trying to stay away. Lilith for the other side is so angry with both of her parents and also with her sister, she escaped two times from home, but the two times, the police got her. Daniel and Mary-Sue aren’t divorce, because they believe the “dream family” can retrieve the position on the city, but right now Mary-Sue met a mysterious man that trapped her attention, in the meanwhile Daniel is going on a middle-age crisis and bought a new and expensive sport car… (I posted these in the “what’s happening...” thread, but for my personal organization, I will repost some things here..."
Looks like all is not so very Pleasant at the moment eh? Your new Sims are so unique! I especially love Thalia. She is absolutely beautiful. Until your thread, I'd never heard of extracting & cloning Sims. I'm going to have to do some research to see how that works and why I might want to do it. I think that I have a tutorial about that process, if I found it, I can send it back to you..., is a great way to save some of your Sims in case of corruption or when you find “Lots with Sims” to download, but you know that if you install that in your hood, your will ruin it, so I install that on my test hood, and extract and clone the Sims appearance to get them in my main hood without problems. Also, I used the Sims Surgery tool in SimPE to fix or change some Sims appearance that I thing are too ugly or bland. #25 9th Jun 2017 at 9:11 PM Last edited by srtv : 26th Aug 2018 at 5:16 PM. I shared this before on the what’s happening in... thread, but this is an important family of my Hood so they need to be here also. "The Cameron Family: Solange, Brad and the little Tina, they apply for a loan and they got it. After that, they moved to “Old town” and rented a house in the most expensive part of the city, right now the money is less every day and they started to work in two local business, but like incognitos, because they don’t want that their new friends know about their real status of money… in the meanwhile the little Tina is showing her true personality, a little evil kid with a great and fake smile… the lies are a big part of this family…"